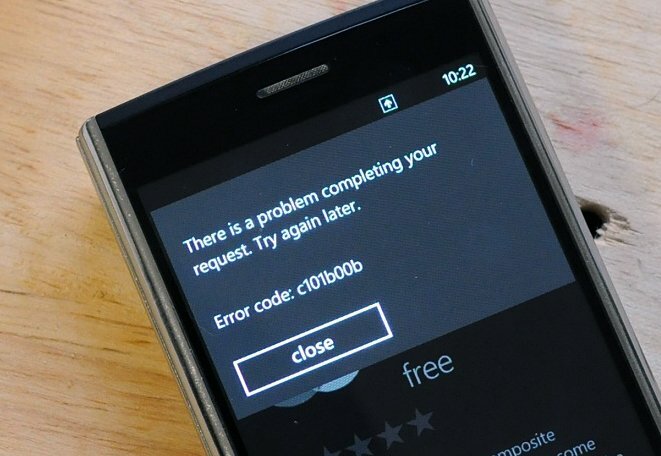 Windows Phone Marketplace error c101b00b, anyone? So we just noticed we're getting a nasty little Marketplace error when trying to download any app today. We're running on Mango and noticed this on a few of our phones, but we sent out a request on Twitter to see if anyone else was experiencing the same. Turns out it's mixed, but definitely a large portion of you are experiencing irregularities in the Marketplace today--regardless of Mango or NoDo. We've heard from Portugal, Norway, Switzerland, US, Romania and Australia so far with parts of the U.S. Italy and UK doing okay. We're not sure what's going as it could be just a temporary hiccup, but we'll keep you posted.